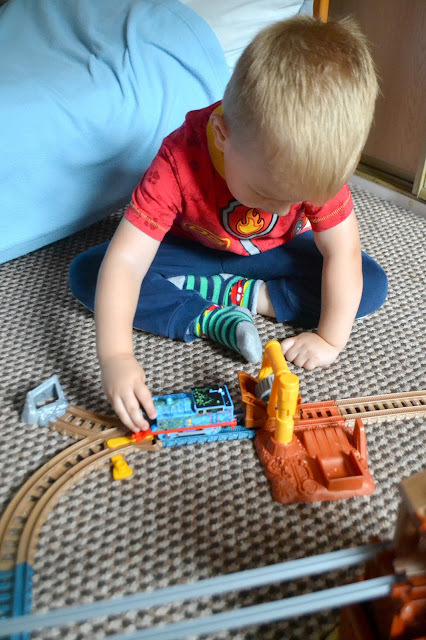 Parker loves to play with all kinds of toys, he will play with dolls, teddies, cars, books but some of his favourites are trains.We were recently sent the Thomas & Friends TrackMaster Scrapyard Escape Set to review which is inspired by the new film Thomas & Friends Journey Beyond Sodor which is in cinemas from Friday 25th August, you can buy tickets HERE. It will also be available on DVD on the 16th October. The film sees new faces help Thomas on his action-packed journey, as he travels away from Sodor and across to the mainland. One of the places he visits is the Steelworks and with the Thomas & Friends track set your little one can join in the fun! Setting up the track was fairly easy and didn't take too long. Thomas does need batteries so make sure you have some to hand. The instructions were clear and the track is even labelled to make it super easy, I only found this out half way through though. 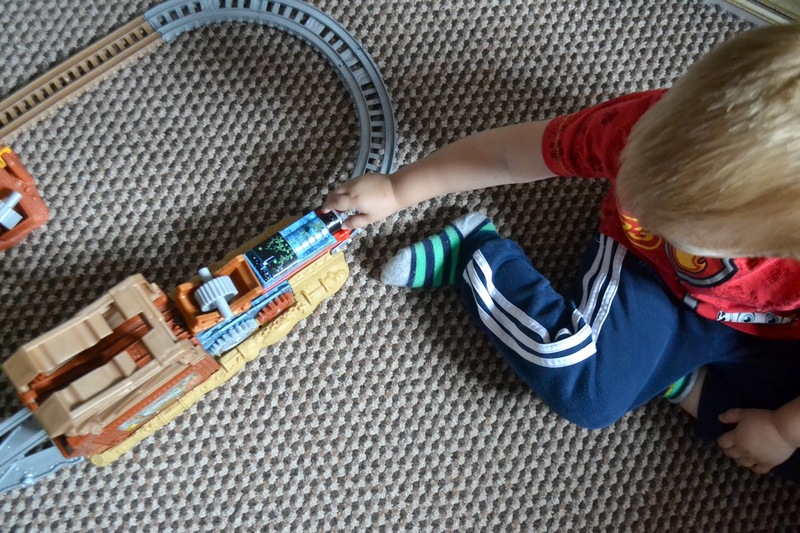 Included in the set is a motorised Steelworks Thomas Engine, which Parker loves. He does keep saying he's dirty though and wants to wash him, Thomas has some plants and dirt on him. There is also a cargo car, two cargo pieces and a full track with a really cool cable bridge crossing. Thomas drives around the track and transports cogs. The cable bridge drops down and once Thomas enters the shack a cog drops down into Thomas' cargo car. Thomas then drives round and as Thomas passes the cargo holder, the arm grabs the cog and drops it in the holder. The track is very simple and can be attached to other TrackMaster sets and expansion sets to create bigger tracks which is a great idea. I love the cable bridge idea and I think it adds a different element of fun, Parker has quite a few train tracks and this is the first time we've seen this idea. He does love to turn the motor off at times and push Thomas around the track. He keeps saying that Thomas is taking the cogs home and then he needs a bath! The set is for ages 3 years and up. Parker is 3 and really loves playing with it. We've even had some other toys/characters riding in Thomas' cargo car and joining in the fun. A great track set for train and Thomas fans. Paige also really enjoys playing with the set and loves running around putting the cogs back in place, it is quite satisfying watching it all work.